Universal Accessibility is proud to offer quality stair lifts manufactured by the top names in the industry including AmeriGlide. Every stair lift featured on Universal Accessibility offers long-term reliability, do-it-yourself installation, and safety features that take the worry out of getting up and down the stairs in your home. For customers who prefer not to do their own installation, we offer an installation service on every stair lift. 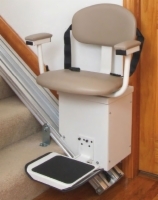 Installation of a stairlift for the average homeowner will normally only take 2-3 hours. Call 1 (800) 470-8941 for our stair lift deals. Battery stair lifts will operate even if the power in your home goes out. Batteries will need to be replaced about every 2 years. Find battery replacements here. Electric stair lifts operate directly from your household outlet. They will not work when the power goes out, but maintenance costs are lower. Heavy duty stair lifts are for heavier individuals and have maximum capacities from 300 to 500 pounds. Outdoor stair lifts are made to endure the tough conditions outside your home and can be placed in totally exposed locations outside.